The Awakening glides ghost-like through its story, laying its own elaborate traps along the way. Following the Spanish flu epidemic and World War I, it makes sense that, as the opening moments of The Awakening tell us, “This is a time for ghosts.” We’re talking bump in the night, see a dark shadow out of the corner of your eye ghosts that stalk the hallways of gothic stone buildings, wailing and menacing any living creature that dares set foot in their territory. This is the world in which Writer Stephen Volk and Writer/Director Nick Murphy have chosen to set their creepy and only slightly derivative supernatural spook fest. 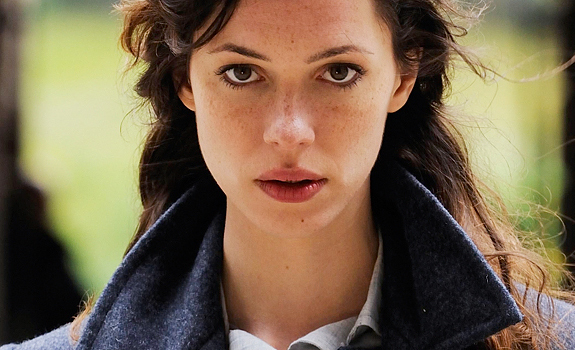 Rebecca Hall plays Florence Cathcart, a bestselling author living in 1920s London who makes her living debunking ghostly hoaxes. In the wake of sickness and war, people are easy pickings for charlatans who promise to reconnect them with their dearly departed loved ones. Florence makes it her business to expose the frauds and document it in order to disprove the existence of the supernatural. In doing so, she manages to inspire admiration from those who applaud her scientific-based reasoning and ire (that sometimes manifests itself in the form of a face slap from grieving séance attendees) from those who are desperate to believe that there is life after death. One day Florence gets a visit from Robert Mallory (Dominic West), a teacher at a boys’ boarding school in barren northern England. He tells her that the school has been plagued by multiple sightings of a ghost boy with a twisted face. He appears in school photographs and stalks the students at night which has resulted in the recent death of one of the boys. Mallory implores Florence (by way of the school’s mistress, a big fan, played by Imelda Staunton) to travel to the school to solve the mystery of the mysterious spectre so the children, all of whom have been all but abandoned by their wealthy globetrotting parents, can stop fearing for their lives. Florence, herself an orphan, agrees and heads to the school to debunk the haunting, only to find that she may have finally discovered real proof that death is not the end of life. To begin with, the film’s setting is just cool. 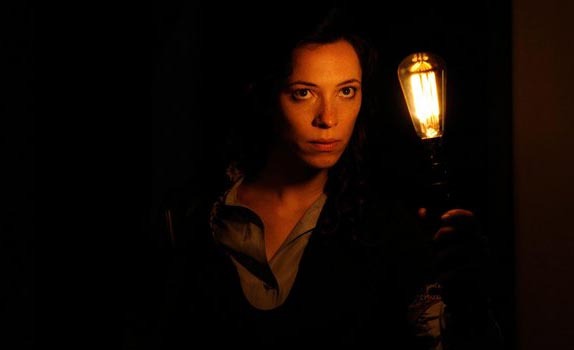 There’s nothing quite like a good, old-fashioned ghost story set on an English estate full of candlelight, echoing hallways and dark corners – something we get far too little of in the current horror genre’s world of cheap jump scares and cartoony special effects. The very first glimpse of the massive stone building brings with it an air of foreboding much in the same way films like The Others and The Haunting (the 1963 version) used their settings almost as an additional character. As Florence approaches you can almost sense the house assessing her, a feeling punctuated by Daniel Pemberton’s moody score. The film also approaches the topic of supernatural investigation in a way that’s far removed from the shaky cam approach popular with the paranormal shows on TV today. It’s refreshing to see the methods employed by the 1920s ghost hunter – cameras rigged with trip wires, bells hung at foot level in doorways, footprint catchers cobbled together with newspaper and powder – especially when they bring on such fantastically creepy results. The film uses the investigation sequences to maximum effect, resulting in shivers galore and a general air of tension that continues to grow as the story progresses. The Awakening glides ghost-like through its story, laying its own elaborate traps along the way and is hardly hampered by an ending that feels a bit predictable and been-there-done-that, especially in light of the films it’s likely to be compared to. At the end of the day, the film delivers what it sets out to do: providing chills, thrills and a reminder that sometimes old-school is the way to go.